The headmistress of a Manchester school which has come near the top of the league tables has praised her pupils for their academic achievements. But Janet Pickering, head at Withington Girls' School, says the league table system gives a jaundiced view of what schools offer. She told BBC News Online that she would be "thrilled" if the system was abolished. Mrs Pickering added that her school had much more to offer than academic success. The league table of A and AS Level exam results, which was published on Thursday, shows Withington Girls' School coming second in the local table after Manchester Grammar School - a nearby boys' school. But Mrs Pickering said, while the results were good for the school, the league tables were "misleading". "Of course we are delighted that we are in the position we are - it makes the school attractive to parents, but league tables only focus on one particular facet of education. "They give a one-sided picture and are open to misinterpretation and abuse. "I would be thrilled if they disappeared." 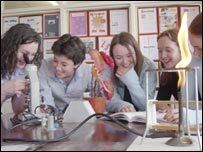 Withington Girls' is an independent school which was set up in 1890 to provide education to girls, with an emphasis on natural sciences. Mrs Pickering said her school was not an academic sweatshop, and added the selection system it employs meant it was not just the brightest girls who get a place. "We are looking for the individual. We do take a range of pupils, but it is at the top of the scale," she said. "We do turn away girls if we don't think they will take advantage of what we have to offer. "The academic focus is really taken for granted and what we want to do is ensure the girls will be fully prepared for anything life might throw at them. "We have been told you can always spot the Withington girls as they are feisty." Head girl Stephanie Barlow, 18, agreed the school was about creating well-rounded individuals. "The teachers treat us in a very mature way and there is a relaxed and friendly atmosphere," she said. "We are given time and room to grow."